This week's challenge seemed like it would be easy, but I won’t lie, I was slightly stumped! I love to recycle and re-use. It gives me a sense of consciousness for my community and its future; it makes me feel like I’m doing something good for myself and others. Although gift wrapping with recycled materials itself isn’t difficult, it’s a matter of whether or not the materials you happen to have at your disposal will actually make good alternatives or be cute enough for wrapping! Sifting through my recyclables, I was able to find paper bags, produce nets, and a cereal box. To add to that, I had my stash of reusable gift bags, tissue, ribbons, etc. that I use for gifting throughout the year. Whenever possible, I keep bags, tissue paper, and stuffing from gifts I receive and put them in my re-use stack. Even when a bag is torn or crumpled, I keep its ribbon or its handles—you just never know how you may be able to up-cycle it later! 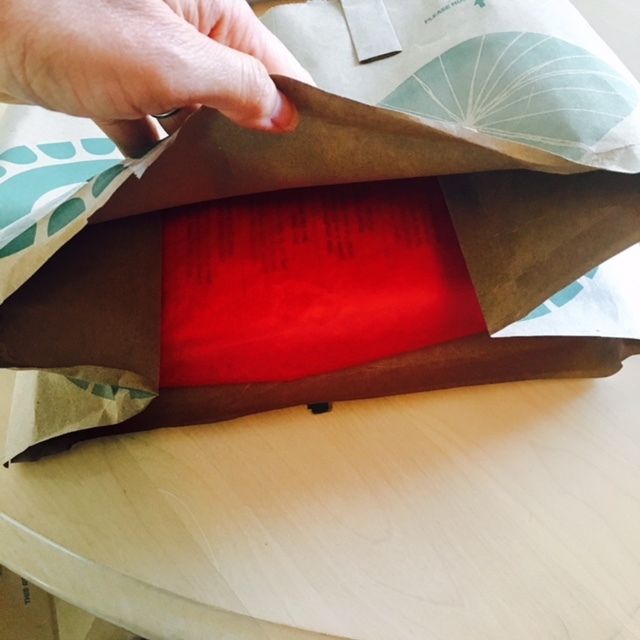 For my first stab at re-purposing, I used a paper grocery bag from Whole Foods. I mean, the words "please recycle this bag" are actually printed on it, so it seemed like an obvious place to start. I decided to use the bag to wrap a book. 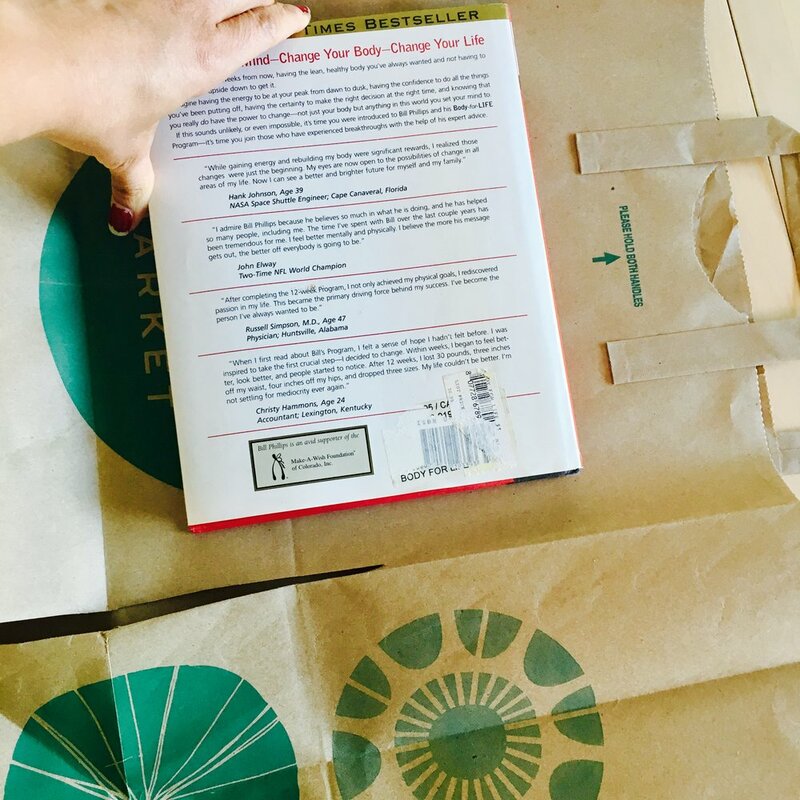 I placed the book on the bag to get an idea of how much of the bag I would need to cut. I could have used the plain side (inside) of the bag, but I liked that it was green and had ornament-like pictures on the outside. For a more classic or clean look, or if you're adding bows, you may want to use the plain side. I cut and folded the bag around the book and taped it. 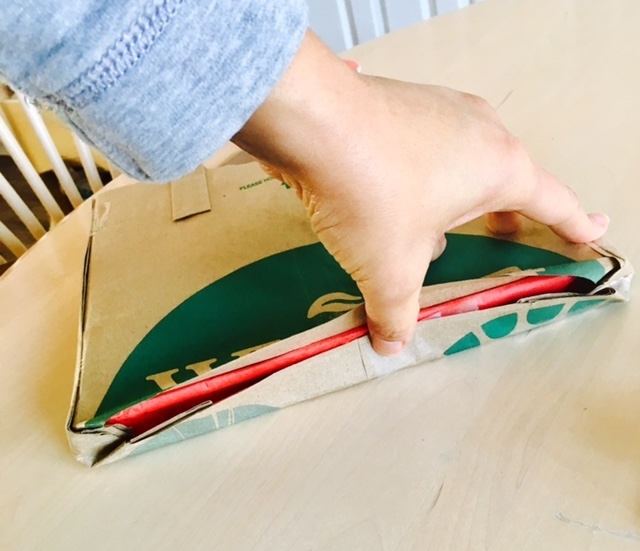 I folded the bottom up, like you would when normally wrapping the side of a gift with wrapping paper. 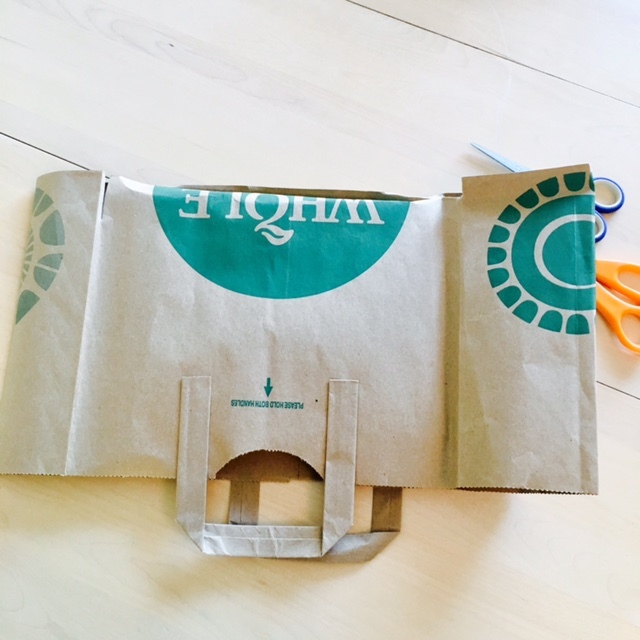 Then I cut out one of the cute pictures from the remaining paper bag scraps and made slits all around it so that it was fanned and festive! I glued the fanned-out pieces on the top of the gift, wrapped the book in tissue paper, and stuffed it into the bag. Voila! 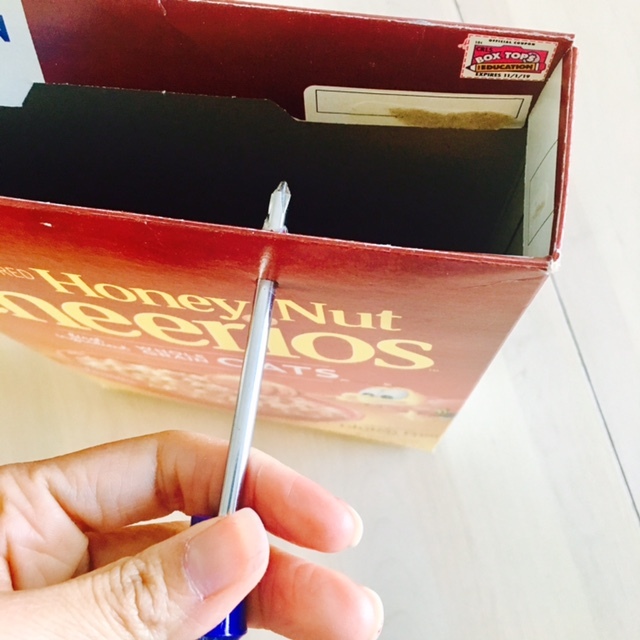 For my second gifting piece of art, I used a cereal box! I know it seems weird, but after thinking about it, I realized cereal boxes are great to hold gifts of books, magazines/subscriptions, candy, cash, or clothing! I like that this wrapping is eccentric, and the unusual package will leave the gift receiver in suspense. 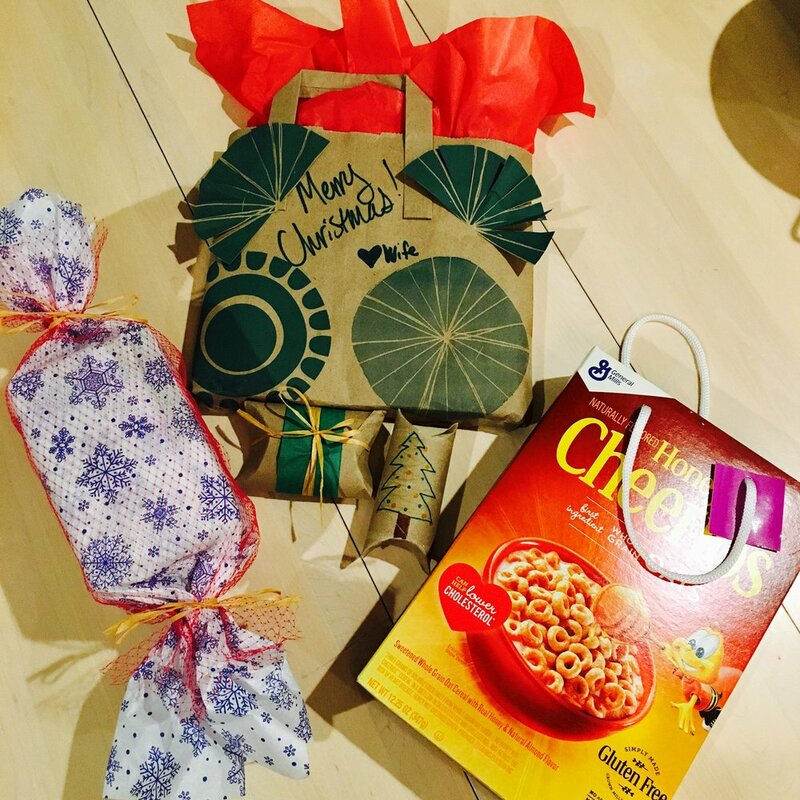 Plus, kids will totally get a kick out of having a gift wrapped in a cereal box—especially if it's a box with colorful pictures or sweet cereal on it! 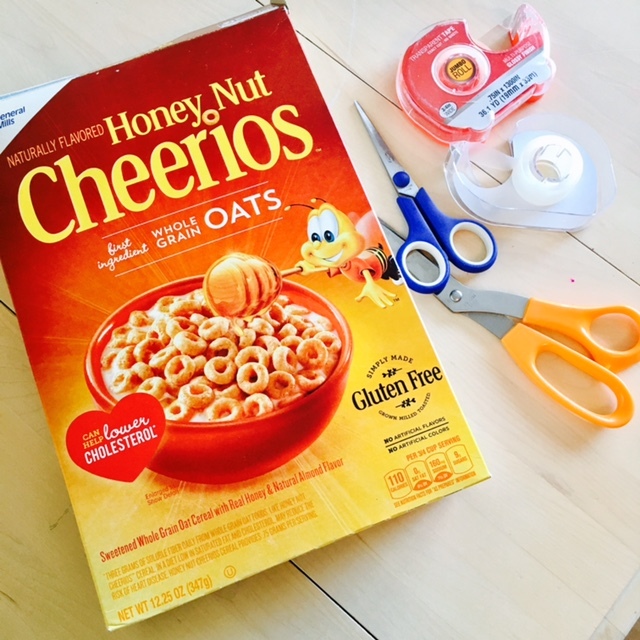 Honey Nut Cheerios is a flex-itarian cereal at my house. It’s been my fav for a long time and now it’s my daughter's favorite as well, so she’ll love getting a present in this box! Last, I used the produce netting from some veggies I recently bought. I decided to wrap a box of K-cups I got for my mom in tissue paper, put the produce wrap over top of it, and then tie the ends like a cute piece of candy! 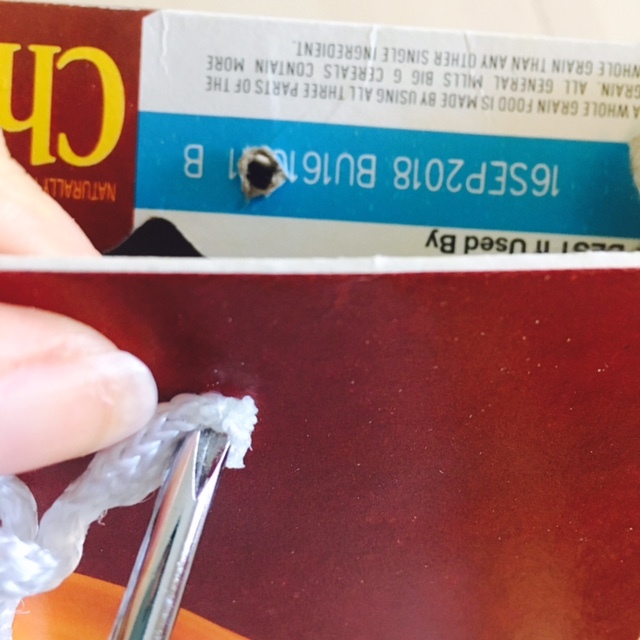 And as an added bonus, I didn’t have to use any tape—super eco-friendly! 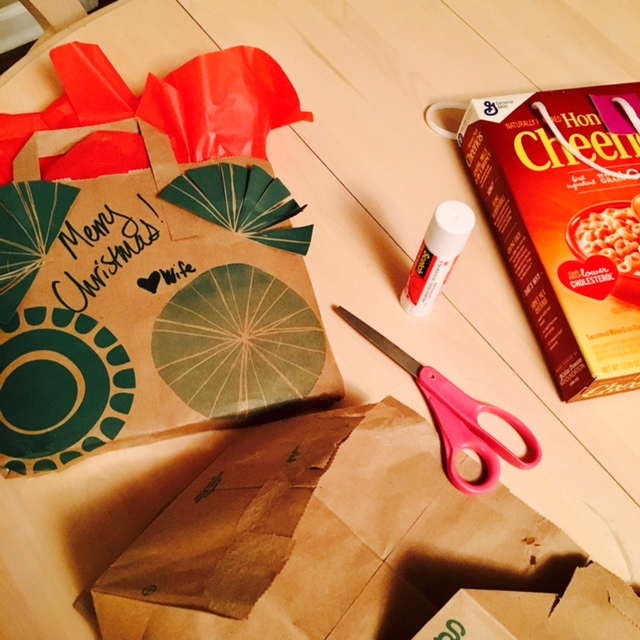 In the end, I don't think I'm going to win the Cutest Wrapping prize for this challenge, but I was able to re-purpose my trash into gift-wrap and come up with fun ideas that I can incorporate into this season's gifting. 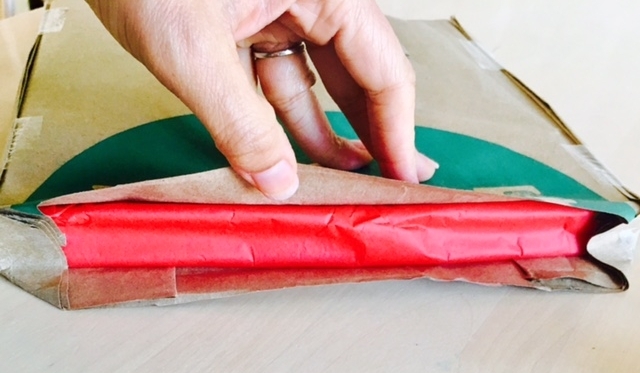 These ideas are helpful in a pinch—or even if you just want unique wrapping! Some of you out there are much better artists, have prettier ribbons, or may be inspired to put a more unique twist on it! Please share your creations with Bluebird + Blackberries on Instagram or Facebook (you can use the tags #bluebirdandblackberries and #challenge12), and let me know in the comments below what kinds of alternative wrapping you're doing!